Download these valuable Service That Sells! posters – free! For more free restaurant management and training tips you can use today, sign up for updates from Service That Sells!. Demystify the art of selling wine and champagne! 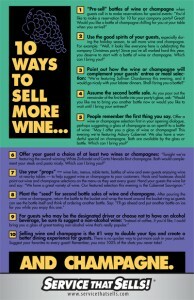 Click the image to download, then print, a full-size poster to use in your wine sales training sessions. Best printing results on 11″ x 17″ matte gloss or semi gloss paper, but can be printed on 8 1/2 x 11 as well. Increase check averages by selling more desserts! Excellent companion to our How to Sell More Desserts online training module. Click here for details. 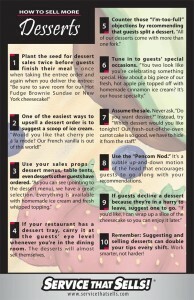 Click the image to download, then print, a full-size poster to use increase dessert sales. Best printing results on 11″ x 17″ matte gloss or semi gloss paper, but can be printed on 8 1/2 x 11 as well. Simple, straight-forward ideas for suggesting appetizers! Excellent companion to our How to Sell More Appetizers online training module. Click here for details. 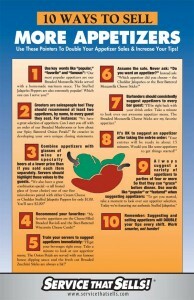 Click here to download the free 10 Ways to Sell More Appetizers poster. Best printing results on 11″ x 17″ matte gloss or semi gloss paper, but can be printed on 8 1/2 x 11 as well. Easy to use, quick result suggestions for selling more specialty drinks! 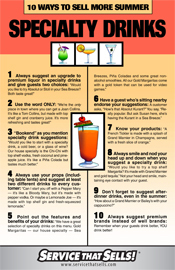 Click the image to download, then print, a full-size poster to use increase sales of specialty drinks. Best printing results on 11″ x 17″ matte gloss or semi gloss paper, but can be printed on 8 1/2 x 11 as well. 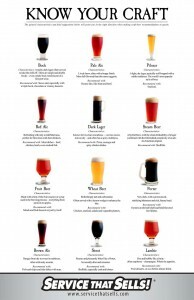 A great craft beer and microbrew reference. You can’t sell what you don’t know! Click here to download the free Know Your Craft poster. Best printing results on 11″ x 17″ matte gloss or semi gloss paper, but can be printed on 8 1/2 x 11 as well. Engaging and interactive, the trainingGrid™ Learning Management System (LMS) makes it simple for you to train employees and track their progress. Fill out the form below to request a comprehensive guided demonstration of the LMS.